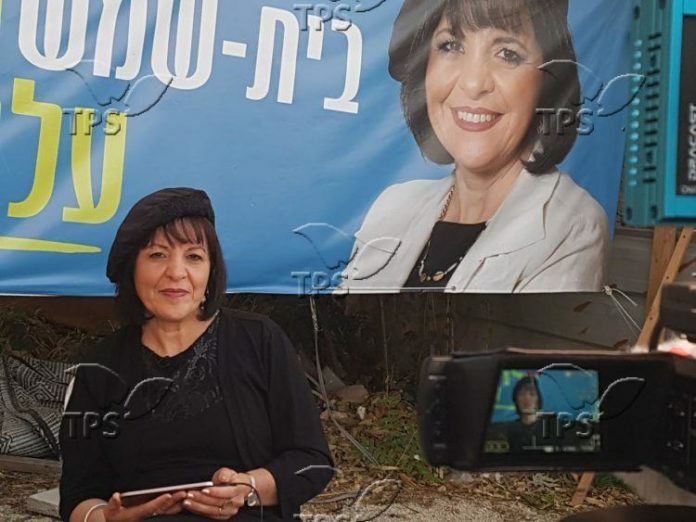 Dr. Aliza Bloch, a religious-Zionist former high-school principal, on Thursday became the first ever woman mayor of Beit Shemesh, after a neck-and-neck race that was only decided after the votes of soldiers and prisoners were counted, giving her a slim 50.6% majority with just a few hundred votes making the difference and ousting the current mayor Moshe Abutbul, of the ultra-Orthodox Sephardic religious political party Shas after 10 years in office. hundreds or even thousands of haredi ultra-orthodox voters cast their ballot for her. The result constitutes a revolution in a city that in recent years has seen an ongoing conflict between the growing Haredi population and non-Haredi communities, both secular and religious-Zionist, over gender segregation in public spaces and women’s dress code, as well as strong inter-communal disputes over the actions of extremist Haredi elements in the city. In an internationally covered incident in 2011, an 8-year-old religious-zionist girl was spat on by Haredim on the way to school for her perceived immodest dress. Bloch, who ran five years ago with the Jewish Home party, ran this time as an independent and was backed by a broad range of parties: Likud, Jewish Home, Labor, and Kulanu. Israel Prize laureate Adina Bar-Shalom, the oldest daughter of the late Shas founder, Rabbi Ovadia Yosef, also supported Bloch. During her campaign, in addition to secular and national-religious Jews, Bloch also appealed to Haredim and a significant part of Bloch’s achievement is attributed to the activity of its Haredi headquarters. The newly elected mayor, a 51-year-old mother of four with a PhD in education who is married to a doctor at Hadassah Ein Kerem, explained she was not surprised that thousands of Haredim voted for her. “In my campaign there were no slurs and dirt, but an attempt to talk to people. Thousands of Haredim voted for me and I was not surprised. I had a staff of ultra-Orthodox activists. From outside, everything in Beit Shemesh seems to be about violent events but there are more than 120,000 inhabitants who want a quiet life and a different image for their place, and my choice has proved it. Beit Shemesh will be a model of coexistence from today, ” she said hours after the results came in. Moti Cohen, owner of Shemesh Net, a local news site, and an activist in the Bloch campaign, said she won the election because her campaign was not negative but proactive, and she promised better management of the municipality. “Beit Shemesh’s infrastructure is worrisome at best, the city is neglected and run down, there is a huge lack of parking spaces and classrooms are crowded,” Cohen told TPS. “We all pay municipality taxes and want to receive good services,” he added. While some pundits have suggested Bloch’s victory is a sign of the beginning of the modernization of Haredi society, Israel Cohen, a writer, and editor for Kikar Shabbat, a Haredi news site, explains that is still early to point to the beginning of such a process. However, Cohen added, from now on the ultra-Orthodox mayors will need to take care of municipal services and not to think only about politics.